Hokies wrestler claimed top prize at wrestling championships. My wrestling knowledge is limited to such topics as: the history of the nWo and what a 'stunner' is. But one doesn't need to be a grappling aficionado to know this — Mekhi Lewis' national championship win is a big deal. Both for himself, and the Hokies (wrestling and at-large). 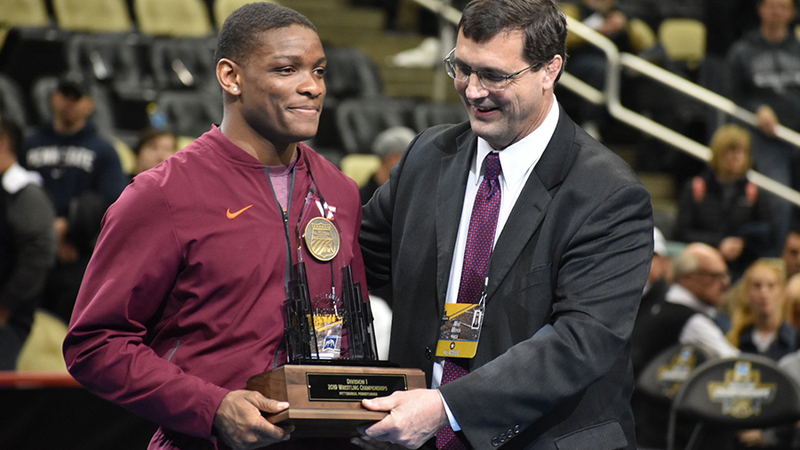 "It means a lot because Virginia Tech wrestling has been really good," said Lewis. "It's just that we never really had good finals, good end results. So to be the first one is really special. It means a lot to me. I'm just so happy that I'm a part of the program." The No. 8 seed captured the 165-pound championship. His impressive path through the bracket included dispatching both the top-seed and a two-time national champion, Vincenzo Joseph of Penn State. "I always wanted to be a national champ, so to have this opportunity and go out there and wrestle and try to become one, I'm just so grateful for it," Lewis, a redshirt freshman, said. Lewis' efforts earned him most outstanding wrestler honors. "Everybody other than my teammates, family, coaches and fans thought that I was the underdog," said Lewis. "I didn't think I was an underdog. I just thought that people didn't have a chance to see me wrestle, at a big stage, like in folkstyle, because they only saw freestyle. And I just felt like, I was prepared and ready to win a national title. So I felt equal to everybody I wrestled." A truly historic night for Virginia Tech. Congrats! It's being posted everywhere but his reaction on the final takedown is priceless, he's smiling, probably crying, and ESPN gets a shot of his family in the background cheering. It's heartwarming, special, and this is one special kid. He completely dominated the tournament with exception of 1 match. Had probably the toughest road to title and crushed the 2X NCAA champ in his weight class. Wasn't even close. If he stays focused he'll be one of the best athletes to compete for tech. Mekhi had an amazing finals match and it ended up being a comfortable margin of victory but so many of these elite matches are so close that essentially nothing is guaranteed. Only 4 wrestlers have ever been four time NCAA champs. Isaiah Martinez from Illinois won two titles his first two years at 165 and was considered dominant in his class until Vincenzo Joseph defeated him in the finals as a freshman two years ago. Then Joseph was a two time champ going for his third title as a junior this year before Mekhi knocked him off. I'm thrilled for Mekhi and VT wrestling but nothing is a given moving forward. That said I look forward to watching him continue to develop as he has the potential to become an even better wrestler in many ways. Def not saying it's a given, but that was an impressive victory over a tough group of opponents. He has a lot to learn still but after watching highlights of junior worlds (3rd freestyle tourny!) and seeing him dismantle NCAA's I think he has potential to be a great. We probably both agree wrestling is a very mental game and in the post match interview he talked about the moment he finally committed to the level of dedication needed then goes on a 20-0 streak. I think it's more about if he sustain that than anything else. That's pretty special for him, and an honor for VT. He beat the two-time national champion from Penn State. Lewis was not taken down the entire tournament. His year included an ACC title, a Junior World Championship in freestyle and now a national championship. Yeah but does he even lift? He lifted that Vincenzo kid like it was nothing. Question: does it seems like if everything was poured into the wrestling program, we might actually achieve a team wrestling Natty (you know, before hoops or football)? Yes, we have placed in the top ten with Dresser as coach. We finished 11th last night by 1 point. We even competed in the BCS version of wrestling the one year it was done for the duals title. Donate to SERTC, Hokie Club, etc. Although PSU has already apparently figured that out. If you thought Bama was dominant at a sport then whoah boy. PSU women's volleyball has been one of the most dominant dynasties there has ever been - rivaling UCONN women's basketball. I don't have the numbers in front me, nor do I care to look it up, but if we're talking about PSU wrestling being dominant then go take a look at their women's volleyball team. They have 7 titles in 20 years. Their run from 2007-2010 is extremely impressive but honestly it doesn't match their wrestling dominance. Unlikely, Penn State is just on another level. They have won 8 of the last 9 national championships. Our realistic goal should be to try to get a trophy which is the top 4 teams and have at least 1 guy in the finals each year. Ohio state won the other one in the 2014-2015 season (when we beat them in Blacksburg duals) and I think has been pretty much placing 2nd every other year. Big 10 has been dominant. Unfortunately no. I'd say a women's sport is our best honest chance. So women's wrestling??? No, but seriously, is there some sort of chart that spells out which sports we're closest to achieving the team Natty (in addition to Bass Fishing)?? I wrestled in High School, while it's a team sport, the individuality is unique. Thia can be the start of going the direction of a Natty - everyone else.in the locker room knows what it takes now. So, we're not just a bass fishing school, anymore........? This might be explained elsewhere, but I couldn't find it. Hokie Sports website says he red-shirted last year but had a 28-2 record wrestling 'unattached'. Can someone explain what that means? Seems that wrestling is the only sport I have heard of that allows athletes who are redshirting to wrestle against actual competition, not just practice. I guess it just doesn't count for the team's scoring, etc.? Pretty cool that he was ranked the #2 redshirt freshman in the country last year (by The Open Mat) and then turned that into a National Championship the following year. Agreed. I think the new redshirting rules for football are great in that they give a similar opportunity for the younger guys to get game experience. To offer further explanation the unattached wrestlers compete in these tournaments but they aren't allowed to have a coach in their corner during the match. It's a great way to get experience and helps fans get a glimpse in to how good a wrestler is going to be. McFadden dominated during his redshirt year as well. I believe track & field athletes can compete unattached as well. Interesting. I didn't realize that. Thanks! Joe - thanks for posting this. Wrestling doesn't really get much conversation here but this was a big deal and deserving of its own front page story. Congrats to Mekhi and the wrestling program! Best thing is that we get to see him for 3 more years! I hope this inspires McFadden in the off season to try to get 2 champs next season, he and Mekhi seem to be very close. In his defeats of both Marinelli (Iowa) and Joseph (Ped St), on the final takedown he celebrates as soon as it happens. In the first you can see his huge grin of victory. In the second he gives a fist pump with 10 or so seconds left in the match. It had to be so sweet for the kid! He first pumped with 20 seconds left. I just watched it again today. I still don't know how he overpowered Joseph on that last takedown. It was Incredible. The only thing I think I see is Joseph's feet got too close together raising his center of gravity causing him to collapse. I think that by that time he had "took his gas money". I hope this propels more people to watch VT wrestling. I only started a year or two ago but once you understand the rules it's an awesome spectator sport.